Paul Heumiller, of Weaverville-based music store Dream Guitars, doesn’t consider himself a salesman—he’s a sherpa. A dealer in the highest of high-end acoustic guitars, Paul Heumiller is in many ways an unlikely entrepreneur. While his company, Dream Guitars, sells fine handcrafted acoustic instruments from the world’s most highly regarded luthiers, he doesn’t even consider himself a salesman. Instead, he’s a guitar sherpa serving up metaphysical soul food. Heumiller’s interest in music came naturally, and at an early age. The youngest of nine children growing up in Freehold, New Jersey, Paul watched several of his older siblings play instruments—keyboards, drums, and guitar—and caught the bug. “I started playing when I was young,” he says. 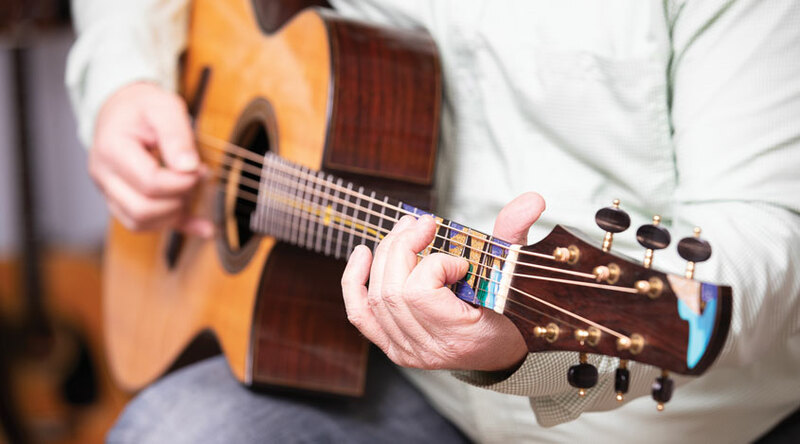 “I took over my sister’s nylon string folk guitar and all of her Alfred’s [Basic Guitar Method] books, and just went through them.” Then his older brother gave Paul an electric guitar. “That, of course, changed my life,” Heumiller says, with a chuckle. By age 13 he was serious about the guitar.